Automobili Pininfarina has released the first official image of the PF0 electric hypercar concept model following a positive programme of private viewings in Pebble Beach during the Monterey Car Week in California, August 23rd to 26th. The management team at Automobili Pininfarina now returns to their German and Italian headquarters to plan the PF0 concept model’s European and Middle East private preview events. Automobili Pininfarina CEO, Michael Perschke and Design Director, Luca Borgogno arrived in New York in mid-July to begin a six week US launch programme to present the PF0 and Automobili Pininfarina’s long-term business plans to luxury car retailers and first customers. The US launch activity culminated last weekend in a successful introduction of the PF0 concept model to invited guests in Pebble Beach – vital for the new car brand as the US will be its strongest market given the demand for electric cars, performance cars and, historically, Pininfarina-styled cars. Prospective clients of the limited-run hypercar will be the ultimate judges of the PF0 design, and four days of private viewings hosted by Perschke and Borgogno have left the new team encouraged and excited by initial feedback. The overwhelming response highlighted how successfully the PF0 balances overall design purity and elegance with innovative functional treatment of aerodynamic surfaces and structures. For a new car company this US launch programme was hugely challenging, exciting and ultimately rewarding. Our guests in Pebble Beach were classic and performance car aficionados and judged that the PF0 design delivered the right balance of beauty and functional performance visuals. They came to see classic Pininfarina and weren’t disappointed. Most importantly, we have some great feedback from clients who have owned numerous Pininfarina-styled supercars. We know we are on the right track and we will now return to Europe to deliver on our aim of producing the world’s most beautiful, innovative and rare hypercar. 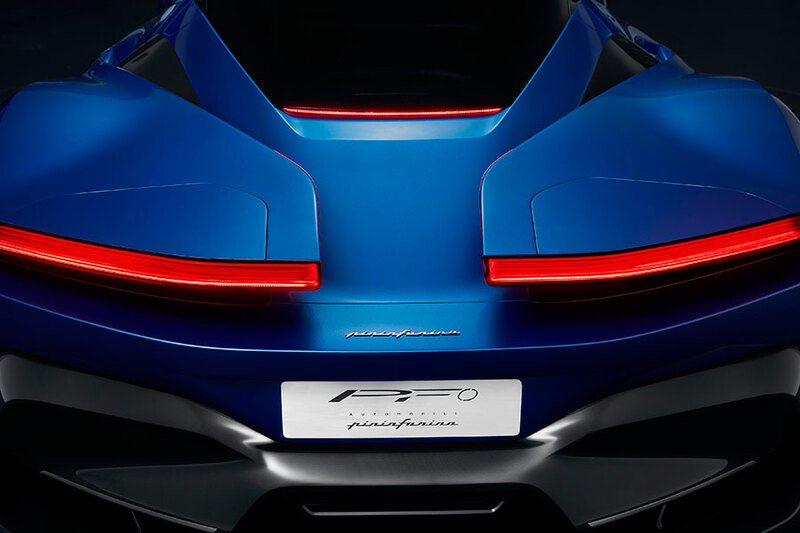 Six months before the final PF0 design and name are revealed at the Geneva Auto Show in March 2019, the Pebble Beach feedback also indicates that demand will outstrip supply for what will be the first production road car designed, produced and branded Pininfarina – a long-held family dream first raised by founder, Battista ‘Pinin’ Farina. Our ambition for PF0 is based on classic Pininfarina principles – to combine elegance and beauty with functional design that defines a new product vision. From 2020 the world will see the emergence of luxury electric hypercars that set new standards for performance and visual drama. Cars dreamt about, but not yet seen on the road. As with Pininfarina cars of the past, PF0 has to stand-out in an emerging sector – beauty and performance to make your heart skip a beat. You can see that impact in the PF0 rear view treatment where the car’s performance potential is functionally supported by dramatic wings, and its beauty highlighted by the overall form – purity and elegance of design has not been lost to the battle for downforce or cooling. Automobili Pininfarina was announced in Rome in April 2018 as the world’s newest car brand with an ambition to sustainably develop and produce fully-electric, ultra-luxury cars at the pinnacle of design and desirability in their respective segments. The Munich-based company will offer a range of cars designed and hand-crafted by legendary Italian automotive styling house Pininfarina SpA. Fundamental to PF0, as with all Pininfarina-designed cars, is an absolute desire to deliver innovation in engineering, technology and performance wrapped in a beautiful skin. As a result, extreme levels of technology and functional design lie beneath the PF0 concept model’s carbon-fibre exterior, supporting the delivery of staggering performance for a road car, accelerating to 62 mph in less than two seconds, breaking the 250 mph top speed barrier, and providing a potential zero emissions range of over 300 miles. Previously released sketch images of the PF0 have presented a full carbon body that is curvaceous and sculptural, encased in sweeping glass. A single dynamic strip of light cascades from the front of the car and takes the place of traditional headlights. Inside the car the cockpit is focused around a ‘vanishing point’ concept for the main dashboard display that will look unique and exciting, focusing the driver’s attention on the job in hand – a new definition of a driver-centric layout.